What's a bibliophile you ask? A person who loves books, of course! 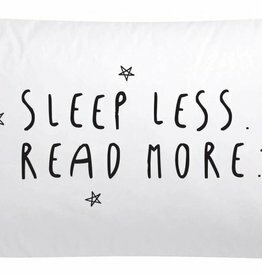 In summary: a superstylish and Proud Bookjunkie-worthy pillowcase (beauty ánd brains). En with the right pillow inside, it's perfect to rest your head on while reading your favourite book. This pillowcase is made of 100% cotton and fits perfectly around a standard pillow (50 x 50 cm or 20" x 20"). This is THE notebook for every brilliant idea. But only the really brilliant ones. When it's finally time to go to bed, you obviously cannot sleep without this special pillow case.